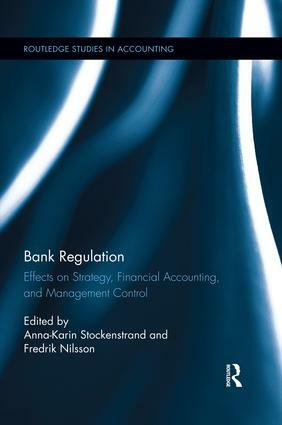 Bank Regulation: Effects on Strategy, Financial Accounting and Management Control discusses and problematizes how regulation is affecting bank strategies as well as their financial accounting and management control systems. Following a period of bank de-regulation, the new millennium brought a drastic change, with many new regulations. Some of these are the result of the financial crisis of 2008-2009. Other regulations, such as the introduction in 2005 of International Financial Reporting Standards (IFRS) for quoted companies in the EU, can be related to the introduction of a new global accounting regime. It is evident from annual reports of banks that the number of new regulations in recent years is high and that they cover many different functional areas. The objectives of these regulations are also ambitious; to improve governance and control, contributing to a high level of financial stability for banks. These objectives are obviously of great concern for an industry that directly and indirectly affects the financial situation not only of individuals and organizations but also nation states. Considering the importance of banks in society, it is of little surprise that the attention of both scholars and practitioners has been directed towards how banks comply with new regulations and if the intended objectives of the regulations are met. This book will be of great value to all those interested in financial stability matters (practitioners, policy-makers, students, academics), as well as to accounting and finance scholars.